- mer (summer) and I went with them to visit the family of Uncle John and Aunt Rhuamah Benedict in Sherman. Aunt Rhuamah was a sister to Grandmother Sherman whose first name was Polly. They were daughters of William and Anne (Ruggles) Phelps. They had two brothers, William Rathbun, that we always called Uncle Rathbun, and Uncle Buggies; one named for his father and the other after the family of his mother. I think Great grandfather Phelps died before I was born but Great Grandmother Phelps lived to a great age, dying when she was in her nineties and I was a lad about fifteen or sixteen years old. Great grandfather Phelps, great grandfather Edwards, and great grandfather Main were American soldiers in the Revolutionary War and as I have written great grandfather Sherman was a soldier in the British Army. The winter of 1842 and 43 I stayed with Mother and attended school in the Aspitch (?) district. 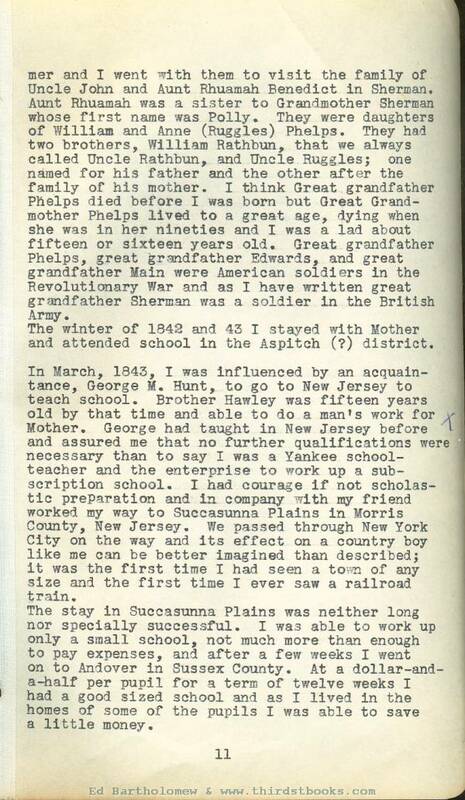 In March, 1843, I was influenced by an acquaintance, George M. Hunt, to go to New Jersey to teach school. Brother Hawley was fifteen years old by that time and able to do a man's work for Mother. 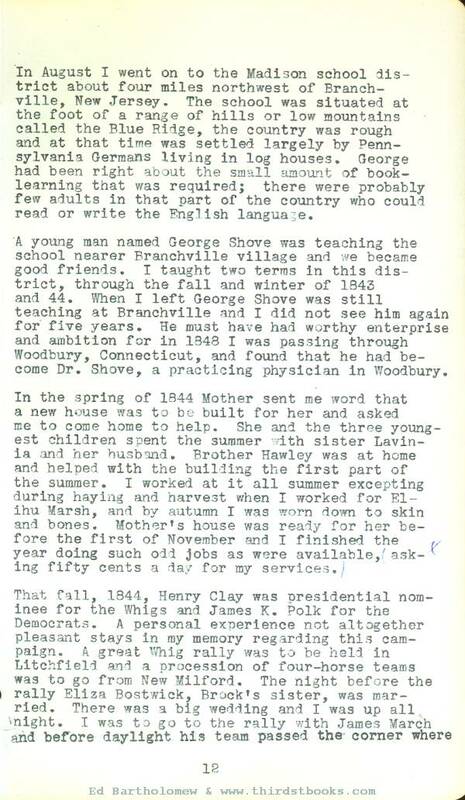 George had taught in New Jersey before and assured me that no further qualifications were necessary than to say I was a Yankee schoolteacher and the enterprise to work up a subscription school. I had courage if not scholastic preparation and in company with my friend worked my way to Succasunna Plains in Morris County, New Jersey. We passed through New York City on the way and its effect on a country boy like me can be better imagined than described, it was the first time I had seen a town of any size and the first time I ever saw a railroad train. The stay in Succasunna Plains was neither long nor specially successful. I was able to work up only a small school, not much more than enough to pay expenses, and after a few weeks I went on to Andover in Sussex County. At a dollar-and-a-half per pupil for a term of twelve weeks I had a good sized school and as I lived in the homes of some of the pupils I was able to save a little money. 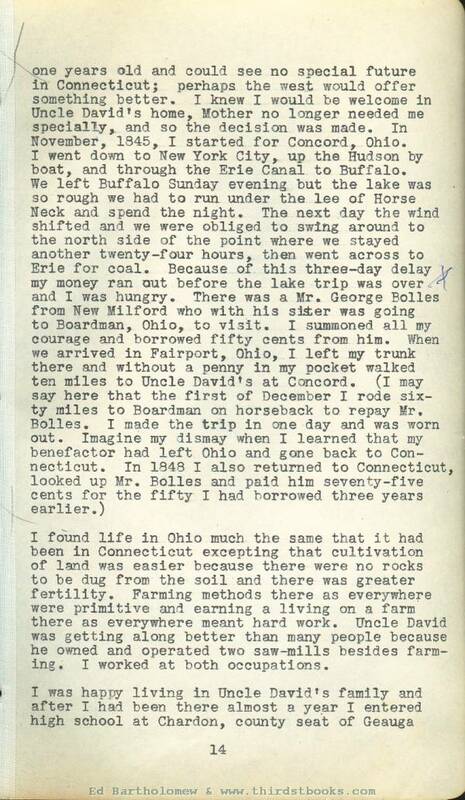 In August I went on to the Madison school district about four miles northwest of Branchville, New Jersey. The school was situated at the foot of a range of hills or low mountains called the Blue Ridge, the country was rough and at that time was settled largely by Pennsylvania Germans living in log houses. George had been right about the small amount of booklearning that was required; there were probably few adults in that part of the country who could read or write the English language. A young man named George Shove was teaching the school nearer Branchville village and we became good friends. I taught two terms in this district, through the fall and winter of 1843 and 44. When I left George Shove was still teaching at Branchville and I did not see him again for five years. He must have had worthy enterprise and ambition for in 1848 I was passing through Woodbury, Connecticut, and found that he had become Dr. Shove, a practicing physician in Woodbury. In the spring of 1844 Mother sent me word that a new house was to be built for her and asked me to come home to help. She and the three youngest children spent the summer with sister Lavinia and her husband. Brother Hawley was at home and helped with the building the first part of the summer. I worked at it all summer excepting during haying and harvest when I worked for Elihu Marsh, and by autumn I was worn down to skin and bones. Mother's house was ready for her before the first of November and I finished the year doing such odd jobs as were available, asking fifty cents a day for my services. I Was to meet him when I was half a mile away. I ran two-and-a-half miles to overtake him. It began to rain before we got half way to Litchfield, a cold northeast rain such as New England has In the fall. I rode all the way to Litchfield and back sitting in the bottom of the wagon with the rain driving down and felt as though I should perish with the cold. One other outing stands out in my memory. The fourth of July, 1845, the same James Marsh asked me to drive to Bridgeport with him. He went to see Miss Irene Buck whom he afterwards married and to the celebration that was held Miss Buck brought a friend. Miss Jane Bronson, to entertain me. 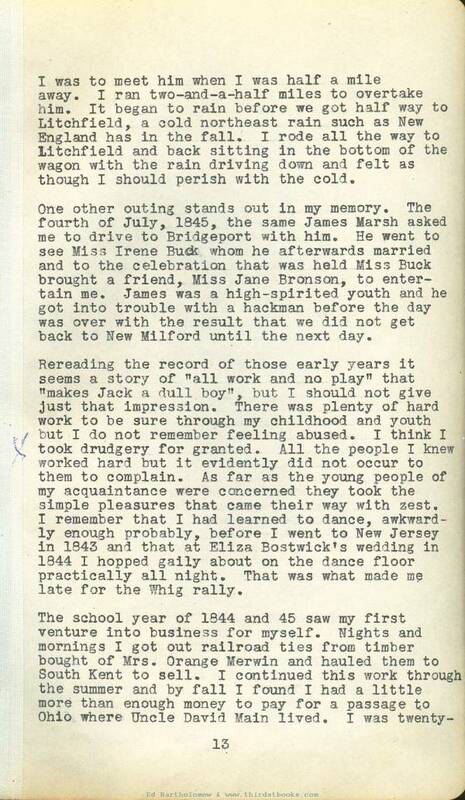 James was a high-spirited youth and he got into trouble with a hackman before the day was over with the result that we did not get back to New Milford until the next day. Rereading the record of those early years it seems a story of "all work and no play" that "makes Jack a dull boy", but I should not give just that Impression, There was plenty of hard work to be sure through my childhood and youth but I do not remember feeling abused. I think I took drudgery for granted. All the people I knew worked hard but it evidently did not occur to them to complain. As far as the young people of my acquaintance were concerned they took the simple pleasures that came their way with zest. I remember that I had learned to dance, awkwardly enough probably, before I went to New Jersey in 1843 and that at Eliza Bostwick's wedding in 1844 I hopped gaily about on the dance floor practically all night. That was what made me late for the Whig rally. County. I was past the usual school age, twenty-two at that time, but my interest seemed to be mostly in books and Uncle David encouraged me to believe an education was still possible if I would stick to the effort to get it. 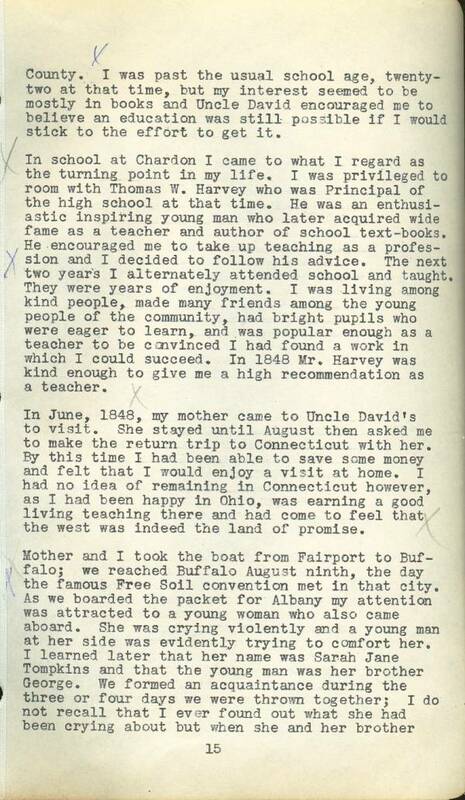 In school at Chardon I same to what I regard as the turning point in my life, I was privileged to room with Thomas W. Harvey who was Principal of the high school at that time. He was an enthusiastic inspiring young man who later acquired wide fame as a teacher and author of school text-books. He encouraged me to take up teaching as a profession and I decided to follow his advice. The next two year's I alternately attended school and taught, They were years of enjoyment. I was living among kind people, made many friends among the young people of the community, had bright pupils who were eager to learn, and .was popular enough as a teacher to be convinced I had found a work in which I could succeed. In 1843 Mr. Harvey was kind enough to give me a high recommendation as a teacher. 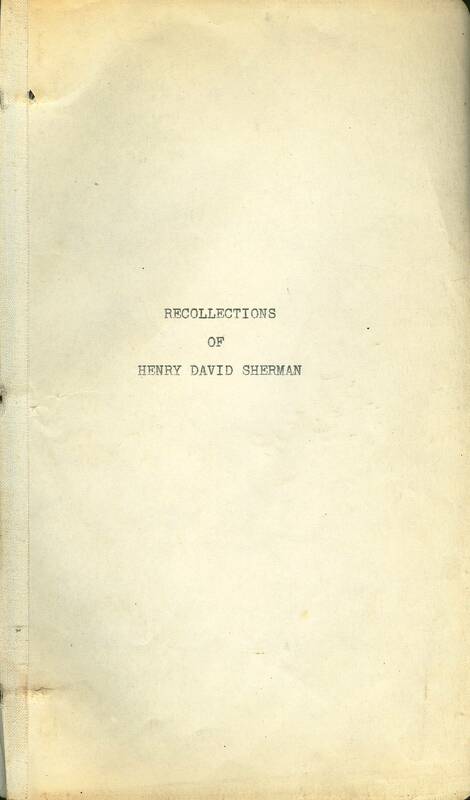 In June, 1848, my mother came to Uncle David�s to visit. She stayed until August then asked me to make the return trip to Connecticut with her. By this time I had been able to save some money and felt that I would enjoy a visit at home. I had no idea of remaining in Connecticut however, as I had been happy in Ohio, was earning a good living teaching there and had come to feel that, the west was indeed the land of promise.